Perhaps not the first choice of many people looking for a trip to the seaside, Cleethorpes is an interesting little resort town with a long stretch of soft golden sand which came into the popular consciousness in the 19th century when the neighbouring fishing town of Grimsby began to grow rapidly and rail connections opened it up to day trippers and holidaymakers from industrial towns like Sheffield, Scunthorpe and Nottingham started to come on stream. The beach has won awards, has blue flag status and is cleaned daily during the season to keep in a nice place to be, and the town itself has all the trappings visitors might usually expect from an English seaside town, with arcades, amusement parks and a pier, but also local nature reserves and a chance to taste freshly caught Grimsby Fish as nature intended, on the beach with some chips. 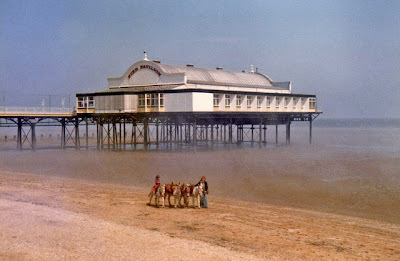 I wouldn't have ever known Cleethorpes except it was on tv this week. Towns must gain and lose fame like the rest of us! 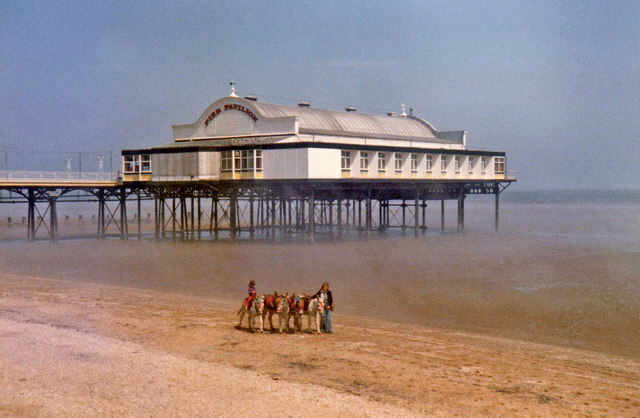 The pier complex looks quite large so I imagine that when it was built, the number of locals, day trippers and holiday makers must have made the project financially worthwhile.